I must admit, I’m not a huge banana fan, but when it comes to banana cake well that’s a whole another story! And if you mix in some kind of chocolate, well then now you’ve got me! 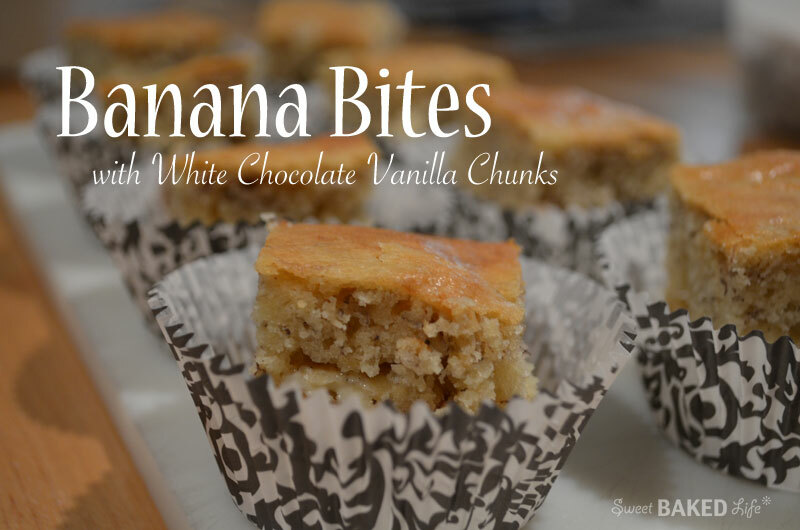 These Banana Bites with White Chocolate Vanilla Chunks are, if I must say quite delicious. The dense yet light texture of the cake sprinkled with the subtle hint of white chocolate infused with Madagascan vanilla is so pleasing. It’s perfect to take along to a picnic or just as a yummy snacking treat! Preheat your oven to 350 degrees. Prepare an 9×13-inch baking dish with cooking spray and set aside. In a large bowl of an electric mixer, cream the butter and sugar until light and fluffy. Beat in the eggs, one at a time and mixing well after each addition. Then add the vanilla. On low speed, mix in the dry ingredients until incorporated. Remove bowl from mixer. In a separate medium bowl, mash the bananas with a fork. Add the bananas to the mixture and stir until blended. Add the chopped white chocolate and gently incorporate. Pour mixture into prepared pan and bake for 50-60 minutes, or golden brown and a toothpick inserted into the middle comes out clean. Let the cake completely cool on a rack. Cut into small squares and put into pretty cupcake liners for a fun presentation. These Banana Bites usually disappear quickly around my home. Again, they are great anytime of the day! So why not whip up a batch for your family and friends this weekend? I looove banana cake! These sound SO good!